Cover of Marvel Adventures: Hulk #14, probably my personal favorite Hulk cover to date. Just brilliant! I really like the dynamic in this and the way you draw Hulk. Mostdef in my collection. Love the way you draw hulk man! Keep killing them pages son. hey man, this is just perfect! looks awesome dude! great job with the expression! Thanks! Tried to go out with a bang. Now that's power! Solid work! This Hulk Rocks Balls! Sweet! i hate hulck,but,this is lovable!!!great!!! teach me ur secret to ink like this!!! Thanks, man. I ink with every tool I can find--brush, quill, tech pen, toothbrush, you name it. Sweet cover. Can really feel him coming at me! makes me want to jump out of the way. Hey, thanks for all those enthusiastic extra 'i's! Hey no problem dude! As you probably already know I love the Hulk. When you have time check out my newest addition to my galary. Sorry me, could I ask you what's your inking tool? I use a lot of different stuff: brush, quill, tech pens, and on this one, an old white out brush. Nice stuff. full of movement. Hot stuff, David! You know I'll be picking this one up! 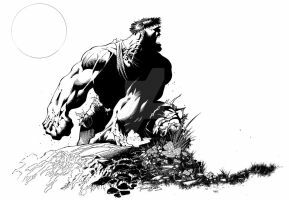 Really nice job on the Hulk and the background inks. he's got some cool chunky colors! very nice job on your end too for sure! It's a different look for my stuff, but I dig it. You rock. 'Nuff said. ^_^ Very awesome piece here. HOLY CRAP...I feel like dodging but I seem to be frozen in AWE!!! any chances of getting the high res B&W's (inks?) to this one..? Your designs and inks keep getting better and better. 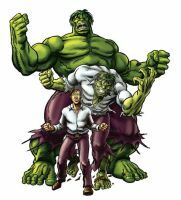 I love your take on the Hulk. Menacing but fun. You can really feel the motion on this one.